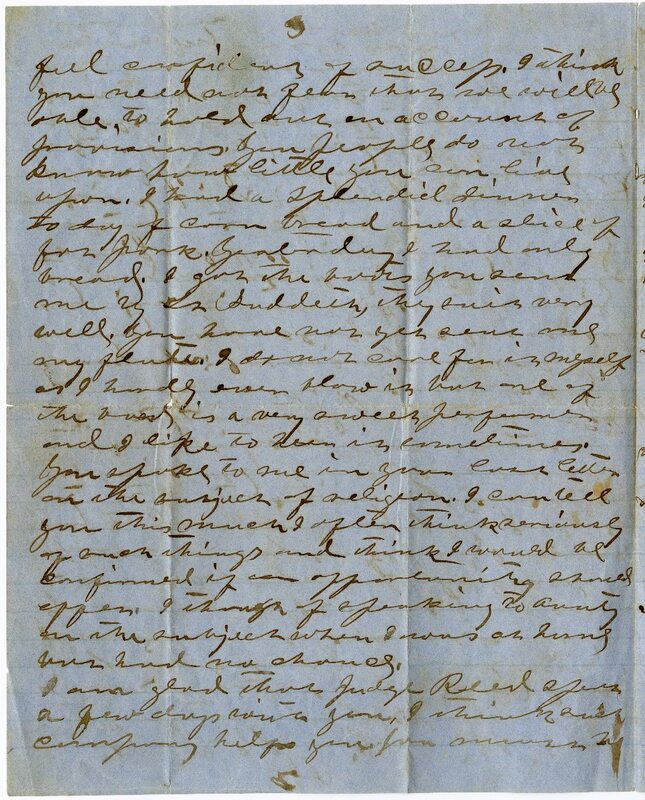 Item Description: Letter, dated 26 April 1864, from John Thomas Jones to his father, Edmund Walter Jones. He describes movements in southern Virginia near Fredericksburg, camp life, and Lee’s North Carolina and Virginia strategy leading up to the Battle of the Wilderness. 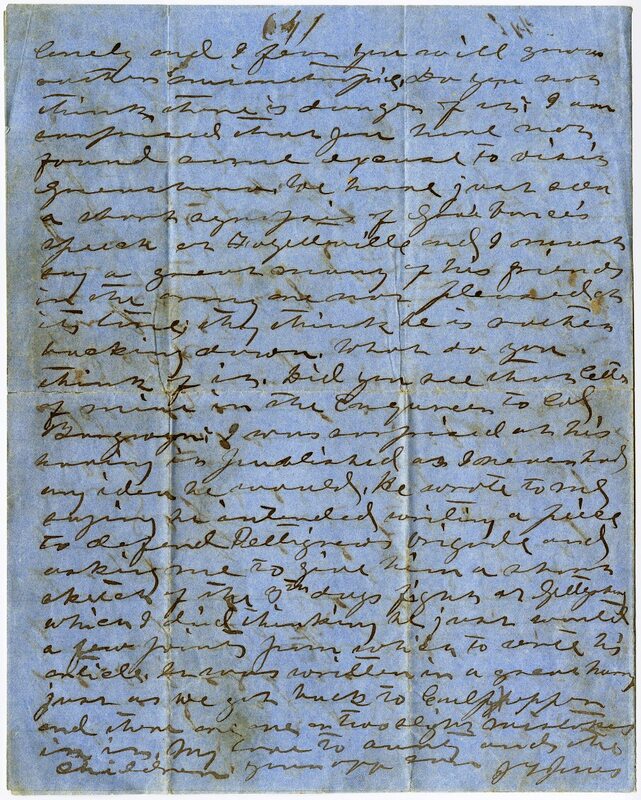 John Thomas Jones died in battle ten days after he wrote this letter. Item citation: From folder 12 in the Edmund Walter Jones Papers #3543, Southern Historical Collection, Wilson Library, University of North Carolina at Chapel Hill. 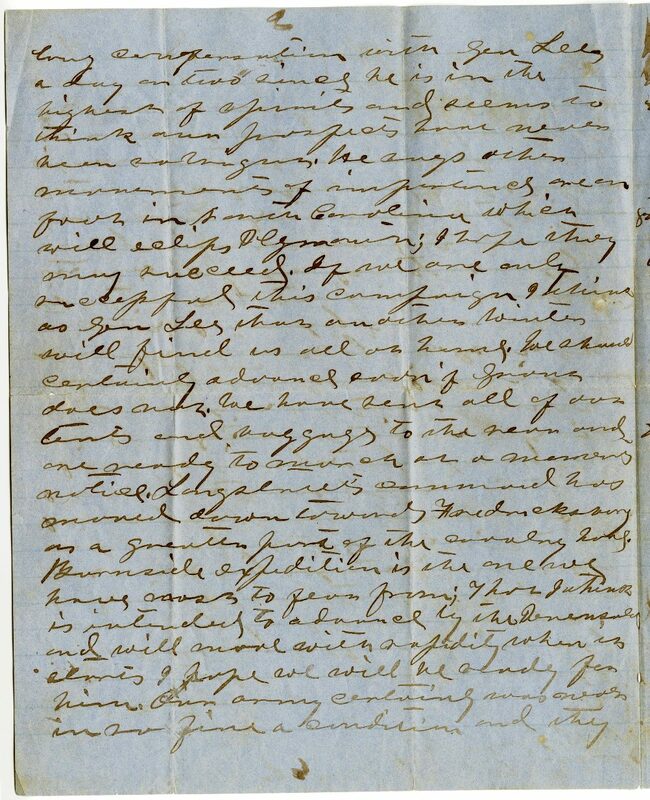 I have just received your letter by Holden and was very much surprised to hear that you had not but one letter from me since my return. I have written at least five letters if not more. I sent you photographs in two which I hope you have gotten. I hardly know what to think of our friends movements in this quarter. It is generally thought here now that Grant has received no material reinforcements. Whether under the circumstances or not, he will advance somewhere soon. It may be on the Peninsula only to hold us here. I had a long conversation with Gen Lee, a day or two ago since. He is in the highest of spirits and seems to think our prospects here never been so in Virginia. He says other movements of importance are on foot in North Carolina. I hope they may succeed. If we are only successful in this campaign I believe will find us all at home. We should certainly advance soon if Grant does not. We have sent all of our tents and waggons to the rear and are ready to march or remain until Longstreet’s command has not arrived down toward Fredericksburg and a greater part of the Calvary has. The Burnside expedition is the one we have most to fear from. I think it is intending to advance by the peninsula and will more with a rapidity when it starts. I hope we will be ready for him. Our Army certainly has never in so fine a condition and they feel confident of our success. I think you need not fear that we will be able to hold out on account of provisions. You people do not know how little your son lived upon. I find a splendid dinner today of cornbread and a slice of pork. Yesterday I had only bread. I got the books you sent me by Lt. Sudderth, they suit me very well. You spoke to me in your last letter on the subject of religion. I can tell you this much, I often think seriously of such things and think I would be confirmed if an opportunity should happen. I thought of speaking to Annie on the subject when I was home but had no chance. I am glad that Judge Reed spent a few days with you.I think such company helps you from being lonely and I hear you will grow rather [?]. Do you not think there is a danger of it. I am surprised that you have not found some excuse to visit Greensboro. We have just seen a short piece of Gov’r Vance’s speech at Fayetteville and I must say a great many of his friends in the army are not pleased by its tone. They think he is rather backing down. What do you think of it? Did you see that letter of mine in the Enquirer to Col Burgwyn? I was surprised at this being published as I never had any idea he would. 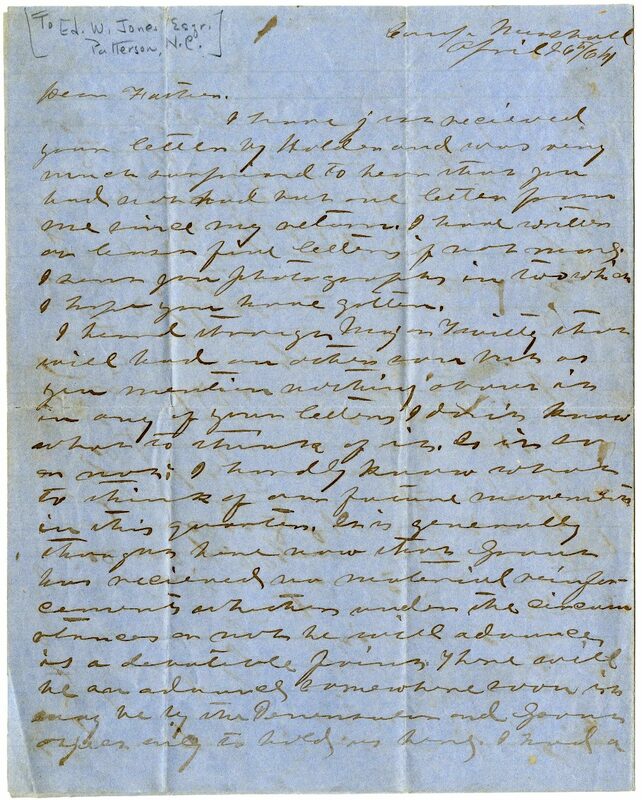 He wrote to me saying he intended writing a piece to defend Pettigrew’s brigade and asking me to give him a short sketch of the 3rd Days fight at Gettysburg which I did thinking he just wanted a few points from which to write his article. It was written in a great hurry just as we got back to Culpepper and then once one or two slight misunderstandings. My love to aunt and all her children. This entry was posted in Southern Historical Collection and tagged Burnside Expedition, Edmund W. Jones, Fredericksburg (V.A. ), Governor Zebulon Vance, Robert E. Lee, The Wilderness. Bookmark the permalink.